Organisations like ICICI Bank put management grads through rigorous internships, says K. Ramkumar, Group HR Head, ICICI Bank. The globalised world and the near double-digit growth in Indian GDP over the last few years have created a major demand-supply gap in management personnel. This has led to an anomalous situation where even mediocre people command a plethora of jobs and premium salaries. On the other hand, the business world has become impatient and intolerant of failures. This paradoxical situation creates pseudo value for people’s untested abilities. At the same time, there is a dearth of space and support for a young person to make mistakes and learn. The system is quick to punish performance shortfalls and seeks out replacements, while all the time lamenting the poor quality and supply of talent. Wrapped up in this false belief about their own importance and worth, these people expect to dictate terms to the organisation right from the beginning on the kind of job they want to do, the boss they prefer to work with, the strategy the organisation needs to follow, the changes they need to bring into the organisation’s structure, systems and processes and more. This is a fallacy because no organisation has the kind of job that meets these kinds of expectations. But, then, I would not blame the students; this myth has been drummed into their heads by the organisations and industry representatives who go to campuses and mislead them. But the upshot is that most youngsters who graduate from B-schools lose their ability to critically look at reality and assess what they are actually capable of doing. They end up wasting the first five years of their careers in trying to search for that non-existent job that they have been promised. Young management graduates should feel fortunate for having got good education and jobs and shed the attitude that they are the best and deserve to get the best. Unlike other streams, management studies do not have tough internships. In all other professions, one has to go through rigorous internships. 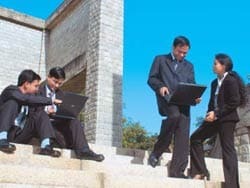 It is this rigour of internship in the first few years that creates a well-rounded professional. Most management graduates are fixated with careerism and about attaining certain titles and earning immediate monetary gains. I do not have a problem with this attitude if only one also spares a thought for professionalism. Professionalism is about choosing a certain domain, working hard towards becoming a leader in that domain and bringing about a change in his or her lifetime within that professional domain for people to remember and respect you. Careerism, according to me, has to co-exist with professionalism. Bschools are oriented towards only creating employee managers and not leaders. MBAs, I would say, are the new administrators or bureaucrats. A leader, on the other hand, is someone who causes change irrespective of the resistance and roadblocks. This is where a rigorous internship supplements the learnings, which, in B-schools, is largely cognitive and idealistic. How young MBAs can be transformed into capable leaders who can deliver results. Managing the aspects of execution, dynamics of multiple people interfaces, overcoming embedded blocks in a system and managing competing and conflicting priorities and agendas without getting exasperated, can be learnt only in an internship of a few years and not during meaningless summer projects. So, given this scenario, it is challenging to manage the aspirations and careers of ambitious MBAs. We have just recruited 200 MBAs from premier B-schools and the first thing we do is to put them through a transition workshop. We sensitise them to the industry. Their excellent marks were valuable only till the time they were given this job. Once they are inside the organisation, those marks and certificates are of no use any more. The workplace is very different from the academic environment that they have come from. As an organisation, we tell the candidates about four main values. First, we want execution skills and not intellectual skills alone. We look for how one can execute under pressure and tremendous constraints. We make it clear that we are not looking for strategic skills initially. Those will be looked into after 10 years of being in the profession. Then, we let these youngsters know that if they cannot work with other people or in a team then they are failures. We want strong emotional resilience. Thirdly, we do not want cherry pickers who only want to do certain kinds of jobs. All jobs are important and to be a leader one has to go through the whole rigmarole. Lastly, we like people who are problem solvers and have the capability of working and managing in disorderly conditions. Today, increasingly, the business world is becoming a place where failure to honour commitments is punished harshly and instantly. The execution orientation has to be coupled with a closure orientation. We make it clear to them that they have to earn the credibility on the platform of performance before they can try to change things. One needs to be a part of the system first and understand it before trying to bring about changes that are sustainable. We make it very clear to the youngsters that knowledge is 10 per cent useful as a concept but when applied to problem solving, it is 90 per cent efficacious. We believe in sensitising the young and capable on what it is to enter a workplace. I would say we have made a beginning in finding ways to help capable youngsters adapt to a world outside the sheltered precincts of an educational institution. But I would also say that we are still experimenting.